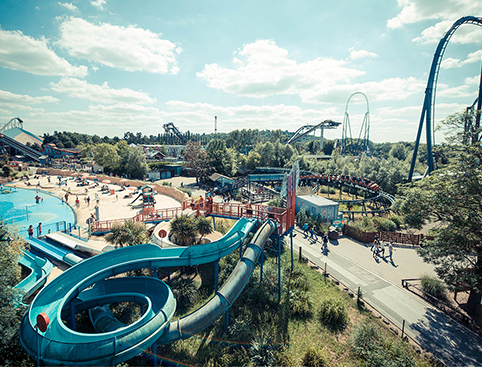 Enjoy a day at THORPE PARK Resort, including all of its fantastic rides and attractions! Enjoy 2 consecutive days at THORPE PARK Resort, including all of its fantastic rides and attractions! 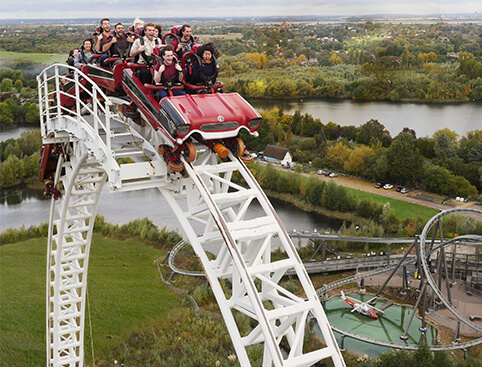 Enjoy 1 day at THORPE PARK Resort, including all of its fantastic rides and attractions! Stay on til the evening to experience the spinechilling Fright Nights event! A full day's admission to THORPE PARK Resort, including all of its fantastic rides and attractions! Simply print off the e-ticket and hand it over at the at the Yellow ''Advanced Ticket Collection'' Building to exchange your voucher in exchange for your entry tickets. You do not have to get in the normal entry queue - just proceed directly to the Sales Office. Tickets are valid for the date selected and specified on the ticket. Simply print off the e-ticket and hand it over at the Yellow ''Advanced Ticket Collection'' Building in exchange for your entry tickets. You do not have to get in the normal entry queue - just proceed directly to the THORPE PARK Sales Office. Your ticket is valid on the date you select when booking. Excludes Fright Nights dates. We’ll send you an e-ticket by email Simply print off the e-ticket and hand it over at the Island Hub Sales Office in exchange for your entry tickets. (You do not have to get in the normal entry queue - just proceed directly to the THORPE PARK Sales Office). Please note that you may be requested to show the credit card that you used to book your tickets. Your ticket is valid on the date you select when booking. Don’t Miss: Swooping through the skies on Swarm, the UK’s first winged rollercoaster! Get thrown, spun, swung and soaked on some of Europe’s most exciting and extreme rides at the UK’s thrill capital THORPE PARK Resort! Prepare for your mind to be seriously derailed on a ghost train re-invented for the 21st century that will leave you questioning where perception ends and reality begins. Crafted by the master of mind control, Derren Brown’s Ghost Train is the world’s only fully-immersive attraction designed to manipulate the human mind. 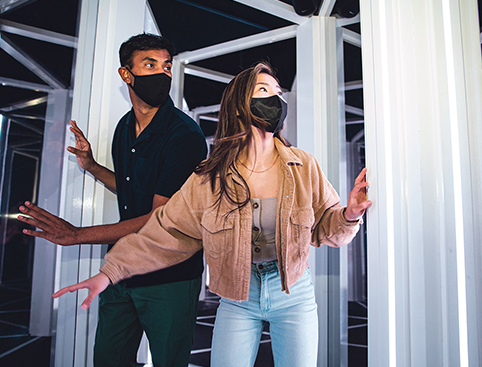 This one-of-a-kind 13 minute experience takes place in a seemingly innocent Victorian train carriage inside a disused warehouse. 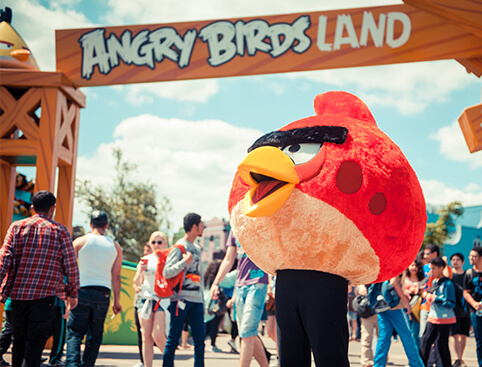 As disturbing sights and sounds fill your senses, it soon becomes clear that you will come face-to-face with what lies at the end of the line…..
THORPE PARK Resort premieres the world’s first Angry Birds 4D animation experience - the centrepiece of an amazing new Angry Birds themed land! Get ready for the game to jump out of the screen and come to life around you, in an all-new, animated experience which captures the fun, colourful world of the birds and pigs using high-impact special effects. The much-loved Angry Birds characters will also be coming home to roost on Detonator – the 100ft rapid drop tower ride - while ‘Red Bird’ and the ‘Bad Piggies’ go bump on a brand-new dodgems attraction. There are also themed retail and catering outlets, perfect for fans of the feathered flocks and piggy characters. Experience death-defying backward flights on one of Europe’s tallest winged rollercoasters! Spin 180° and plunge 127ft into an apocalyptic wasteland, speeding unknowingly towards a terrifying near-miss as THE SWARM tears through the sky on a mission of complete annihilation. The Unholy Trinity – Can you Handle it? Colossus: Daredevils brave enough to try out Colossus will experience stomach-churning inversions on the first ever 10-looping rollercoaster in the world. Stealth: Or how about Stealth - at 0-80 mph in less than 2 seconds it's officially the fastest and scariest coaster in Europe! Nemesis: Finally, navigate the awesome Nemesis Inferno, which gives riders a spine-tingling 4.5 G-Force adrenaline rush! Unleash the Speed Freak Within! THORPE PARK Resort has plenty of hair-raising rides to keep the adrenaline flowing, like Rush, the biggest air-powered speed swing in the world. Not done yet? Get ready for a super-soaking on the epic Tidal Wave! If all that's not enough, experience the nerve-shredding 100ft ‘beyond vertical’ drop of the terrifying rollercoaster, SAW – The Ride. ….And when you just can’t take any more, there are also plenty of slower-paced attractions as well as fun and adventures for the little ones. There are 8 themed zones set in 500 acres at THORPE PARK Resort, including family-themed and “tamer” rides. …and if you don’t mind getting a bit (ok, well maybe a lot!) wet, try Depth Charge, Rumba Rapids and Loggers Leap, a hair-drenching double-drop water ride. THORPE PARK Resort has an entire colourful zone especially for younger children, with fun and creative rides like Slippery Serpent, Ollie Octopus and the Chief Rangers' Carousel. …And the Fun’s Not Over Yet! It’s not just about the rides! The fun continues with daytime and evening entertainment - from exclusive Summer Nights evening ride time and outdoor arena shows to comedy and club nights hosted by world-famous brands. 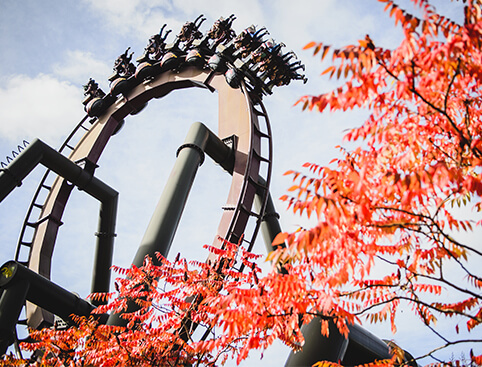 THORPE PARK is open 29 March – 3 November 2019. Gates open at 10am but closing times vary depending on the season or at weekends. We recommend that you check with the park before your visit. The theme park is closed on the following dates: 1-4 April, 7-8, 14-15, 21-22 May, 17-18, 24-25, 30 September, 1-2, 7-9, 14-15 October 2019. Fright Night dates: 3-6, 10-13, 17-31 October, 1-3 November 2019 (Fright Night Ticket required). Staines Road, Chertsey, Surrey, KT16 8PN. All directions on where to park when you arrive will be clearly signposted on the day of your visit. Parking fees are £5 per day. Height restrictions apply on certain rides. Address: Staines Road, Chertsey, Surrey, KT16 8PN. Location: THORPE PARK Resort is situated between junctions 11 and 13 of the M25. (Access from Junction 12 of the M25 is not possible). By Train: Staines is the recommended railway station for travelling to the park. THORPE PARK Resort Tickets is rated 4.1 out of 5 by 29. Rated 4 out of 5 by Christmas from Good day out Bought tickets for family of x3 adults x 2 children. The rides were awesome and the 2 men of the family enjoyed this element of the visit. The ticket price to include the meal deal was very good value. It was a weekend so we expected there to be a few people around; however the queues were in excess of 90 minutes for the larger rides - far too long. Even the queue to buy fast-pass tickets was an hour long! This does seem to be the way that they want you to go - spend more money. There were very few rides for children under 1.3m and those that they had weren't all open. I think the park also needs to sign post the car park ticket booth as this caused some confusion for many people. Rated 3 out of 5 by Lesleyed1 from Too long queue's Could be a great experience,but the queue's for rides are too long. In the heat this is very off putting. Three attractions were closed for maintenance which made the other rides have longer queue's. We all felt that there should be less people let in to the attraction. That said the big rides looked fantastic for those who like the thrill. The beach was a nice idea,but was packed. For the wet rides they had drying off booths which was a great idea but cost £2 a go!!!! My grandchildren were happiest getting soaking wet from a ride which splashed the public! Rated 4 out of 5 by Nat3 from Great for thrill seekers! Bought tickets for family, were a good price compared to buying on the day and had a free hotdog meal thrown in which kids enjoyed (& at the park would have cost around £7 each). I would say Thorpe park is more for older kids ride wise but all had a good day. If you actually want to get on everything in one day, as a family of 4, expect to pay around £100 extra when you get there on fast passes as it can't be realistically done without them in school hols.